How much time should kids be allowed to stare into their screens like zombies? 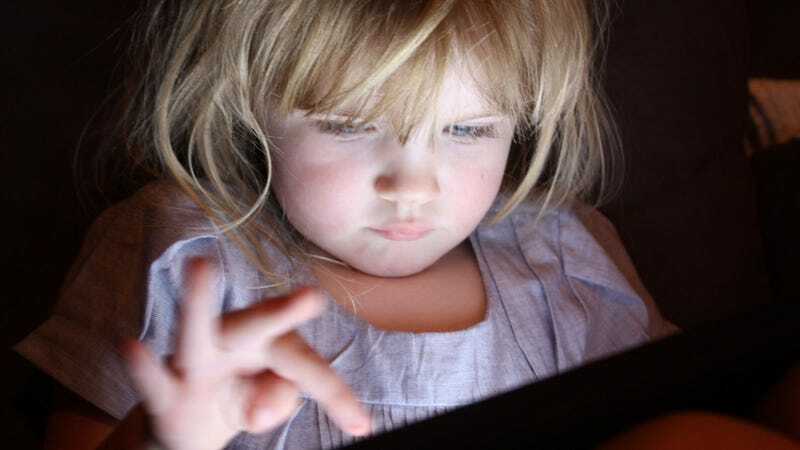 New guidelines issued by the American Academy of Pediatrics upturns conventional thinking on the matter, showing that a sweeping one-size-fits-all approach is not the right way for parents to go about limiting their children’s screen time. For years, the American Academy of Pediatrics (AAP) has told parents to limit their child’s screen time to no more than two hours per day, whether that time is spent in front of a television, tablet computer, laptop, or mobile phone. What’s more, the AAP made virtually no mention of age, or the kind of content that should be limited, issuing a simplified blanket approach to media use. In a series of papers published today in the science journal Pediatrics, it’s clear that the AAP has significantly revised its thinking on the matter, breaking down media use according to all these criteria. And to support parents with these new recommendations, the AAP has published an interactive, online tool that families can use to create a personalized Family Media Use Plan. To say that these revised guidelines are long overdue would be a gross understatement. As any parent knows, not all media content is equal. Accordingly, the AAP now makes a distinction between entertainment and educational programming. This means that parents can now be a bit more lenient when their tweens need to hit up Wikipedia while doing their homework, or when they’d like to tackle some modules on Khan Academy. That said, the AAP says parents need to limit the entertainment side of media use, pointing to social media, video games, commercial television, and streaming services. For school-aged children and teens, the AAP says it’s important to balance media use with other healthy behaviors, and that problems begin when excessive screen time interferes with experiences critical to learning, such as physical activity, hands-on exploration, and face-to-face social interaction. For younger children, the AAP recommends that children under the age of 18 months avoid screens altogether, except for apps like Skype and FaceTime which they can use to chat with grandma and grandpa. Children between 18 to 24 months can be introduced to digital media, but the AAP says it needs to be “high-quality programming” (the AAP doesn’t define what it means by that, but it clearly doesn’t want young children to be watching any old garbage) and that parents should watch it along with their children to help them understand what they’re seeing. Similarly, children between the ages two to five should be limited to high-quality programming, with screen use limited to one hour per day. Again, the AAP is asking parents to co-watch these programs with their children. Kids who are six and older should have “consistent limits” placed on the time spent using media, particularly of the entertainment variety. Parents should make sure that screen time isn’t getting in the way of adequate sleep, physical activity, and other healthy behaviors. Lastly, the AAP says parents should designate media-free times for the entire family, such as during dinner or while driving, and that families should also create media-free zones in the home, such as in bedrooms—which, good luck. Indeed, these guidelines are all well and good—and they’re undoubtedly not even wrong—but implementing these prescriptions is another thing entirely. The AAP, with its lofty recommendations, doesn’t sound entirely in tune with the realities of daily life. Parents obviously want to raise healthy children who aren’t constantly glued to computer screens, but these devices are a godsend for those moments when a parent needs to make dinner, or when they simply need to go to the bathroom. A few moments of peace and quiet can do wonders for a parent, powering them with the patience to truck on and put on a genuine smile when the kids comes calling. When it comes to limiting screen time, there’s a tradeoff between parental health, and the needs of a child—and that needs to be acknowledged. And let’s face it, sometimes it’s fun for both the kid and the parent to watch Minions for the 30th time.